I am excited about this news! As the press release below states, the annual FGS conference will be held in conjunction with the RootsTech event hosted by FamilySearch in 2015. I love visiting Salt Lake City and may be able to attend both events if they are held together. I am putting these dates on my calendar. 22 August 2013 – Austin, TX. 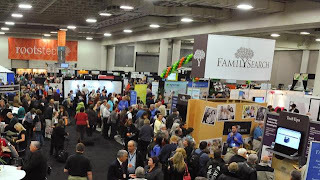 The Federation of Genealogical Societies (FGS) announced today that its 2015 National Conference will be held February 12-14, 2015, in Salt Lake City, Utah in conjunction with RootsTech, hosted by FamilySearch. RootsTech is held each February in Salt Lake City and helps thousands of attendees from around the world discover and share family connections, stories, and history. With the Salt Palace Convention Center as the common venue, both FamilySearch and FGS are committed to producing a one-of-a-kind genealogy event addressing the educational needs of the family history, technology and genealogical society communities. As the logistics of this sizeable event are still being worked out, both FGS and FamilySearch will work together to share resources and provide cost benefits for all parties, including attendees and exhibitors. Attendees can expect to see familiar elements of previous FGS and RootsTech events including keynote presentations, a Society Showcase and Expo Hall. Registration for both events will begin in August 2014, six months prior to the February 2015 dates. FGS will also hold a smaller national event for its members in late 2015, with details to be announced at a later date. FGS President D. Joshua Taylor states, “FamilySearch has been a valued partner and sponsor for FGS during its past conferences. It only makes sense for both organizations to work together and produce what will be the most talked about genealogy events of 2015.” Taylor added that such an event brings the best of RootsTech and FGS conferences together under one roof and will offer genealogists and family historians a wide array of activities and educational opportunities. The Federation of Genealogical Societies (FGS) was founded in 1976 and represents the members of hundreds of genealogical societies. FGS links the genealogical community by helping genealogical societies strengthen and grow through resources available online, FGS Forum magazine (filled with articles pertaining to society management and genealogical news), and Society Strategy Series papers, covering topics about effectively operating a genealogical society. FGS also links the genealogical community through its annual conference -- four days of excellent lectures, including one full day devoted to society management topics. To learn more visit http://www.fgs.org. SLIG's Advanced Evidence Practicum: Are you up to the challenge?